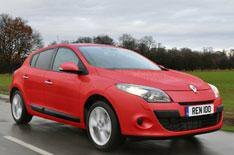 Entry-level Renault Megane launched | What Car? Renault's latest Megane hatchback is now more affordable, thanks to the addition of a new entry-level trim. The Extreme model costs 900 less than Expression trim, but still comes with air-conditioning, a CD player, stability control, front, side and curtain airbags and electric front windows as standard. However, it goes without a 60/40 slpit rear seat, a front centre armrest or electric door mirrors. There's a limited choice of engines, too, with only a 99bhp 1.6-litre petrol or an 85bhp 1.5-litre diesel available. Prices are 13,250 and 14,950 respectively, making the Megane at least 915 cheaper than the entry-level Ford Focus or VW Golf five-door models. Extreme models are available to order from May, with deliveries expected to start in June.